I've been reading a little lately about the notion of information fluency and digital literacy in relation to some work I've been doing, and came across this interesting infographic below from Denis O'Connor. It's an interactive infographic which allows you to click on a topic and you're taken to resources on the 21st Century Information Fluency website. I like the way the five key questions in this diagram supports an agentic approach to thinking about information fluency, with the embedded links taking you off to more information to help resolve your personal response to these questions. Could be a useful poster in its existing form in a classroom too. David's concern about the growing disconnect between the data-rich and the data-poor is a salient reminder that, as we become increasingly immersed in the digital world, the notion of a digital divide is defined not simply in terms of those who have access and those who don't but those also by those with the knowledge, skills and dispositions to navigate their way through the morass of data, content and applications etc. and those who don't. The focus in David's comment is specifically on data. We are awash in it – overwhelmed by it. As he illustrates, we are generating it in quantities unprecedented in human history. Schools aren't immune. We generate large quantities in our SMS systems, our LMSs and our accounting packages to name a few. The introduction of increasingly sophisticated analytics applications helps us yield valuable information from this data – but the ability to conceive of and follow through with the development of these sorts of tools, and the interpretation of what they reveal requires specialist abilities. Imagine the benefit to our school systems if we had access to the sorts of tools and algorithms used to underpin how Amazon operates for instance, or how Google customises search etc. Our ability to customise personal learning pathways for students, to anticipate learning needs, gaps in resources or target specialist interventions would be greatly enhanced. This sort of activity would certainly differentiate between the haves and the have nots in terms of data and data use. First – we need to consider the concept of what David calls 'data literacy', as a part of the wider concept of digital literacy, and ensure that we are catering for its development in all areas of the curriculum and across all levels of the school system. The goal of developing digitally literate, data-savvy students should be a priority in our student graduate profiles, along with basic literacy and numeracy skills. Second, we need to agree on some system-wide approaches to data management and use. The e-asTTle tool that is currently being used in schools demonstrates well the benefits that can be achieved when large quantities of data are analysed and represented in ways that allow for informed decisions to be made about student learning. Imagine what more could be achieved if schools became even more collaborative in sharing the data they have to assist in building real-time analytics to help inform key decisions about resourcing, placement of teachers, targetting courses etc. As we prepare for the return of students to our classrooms, many teachers and schools will be considering the implications of their BYOD programmes and increased wireless access meaning more kids using digital devices in school. With such privilege comes responsibility, and a key focus for teachers, leaders and school policy makers must be on thinking through the implications of such decisions, and how this all contributes to the overall academic and personal development of our students. Jason Ohler has written extensively on using technology effectively, creatively and wisely, and is known to many NZ teachers through his keynotes and workshops at ULearn and other conferences here. A couple of years ago he wrote an article in Educational Leadership magazine that summarises the dilemma very well. He writes..
Our challenge is to find ways to teach our children how to navigate the rapidly moving digital present, consciously and reflectively. How we meet this challenge depends on how we address the following fundamental question about teaching our digital-age children: Should we teach our children as though they have two lives, or one? Balance. Understanding past, present, and possible future effects of technology. Cultivating a sense of balance that considers opportunity as well as responsibility, empowerment as well as caution, personal fulfillment as well as community and global well-being. Safety and security. Understanding how online actions might lead to harm to yourself or others. Includes protecting your own privacy, respecting that of others, and recognizing inappropriate online communications and sites (such as sexual material and other resources intended for adults). Cyberbullying. Understanding the potentially devastating effects of cyberbullying and how it violates ethical principles of personal integrity, compassion, and responsible behavior. Sexting. Understanding the negative consequences of using a cell phone to take and transmit pictures of a sexual nature of oneself or others. Copyright and plagiarism. Respecting others' intellectual property rights and reflecting on the legality and ethics of using online materials without permission (a complex and murky area of the law, bounded by "fair use" guidelines). Computers (aka digital technologies) have been in our classrooms and schools for four decades now – almost as long as I’ve been an educator – yet still we’re trying to find a way of describing or explaining what the contribution is of these devices to the education of our young. As the use of digital technologies has become more pervasive, the focus of attention has shifted to questions about the measurement of this impact – both in terms of the contribution of digital technologies to learning, and in terms of the qualities and we deem to be desirable in the users of these technologies, those who will live their lives in an increasingly digital world. When I started working with computers with learners, the focus of attention seemed to be predominantly on teaching the skills associated with their use – how to open files, save files, cut-and-paste etc. 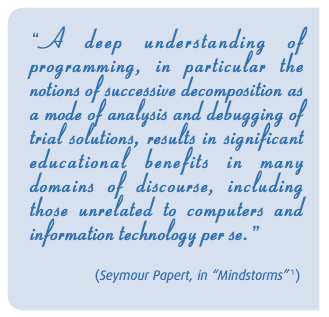 These foundational skills are still regarded as important, and in the 1980s there was a big demand for courses with this focus. Nowadays it’s questionable just how much of this needs to be ‘taught’ explicitly vs. learned in the process of using. Many schools are using some form of ‘computer drivers license’ or ‘digital passport’ to provide explicit expectations of students in terms of their digital proficiency, but how these are learned and demonstrated is left to the students. The OECD suggests that governments should make efforts to identify and conceptualise the required set of skills and competences, and then incorporate them into educational standards and, in response to this suggestion, there are several national projects working on defining national standards. More recently there’s been a shift to talking about digital literacy. 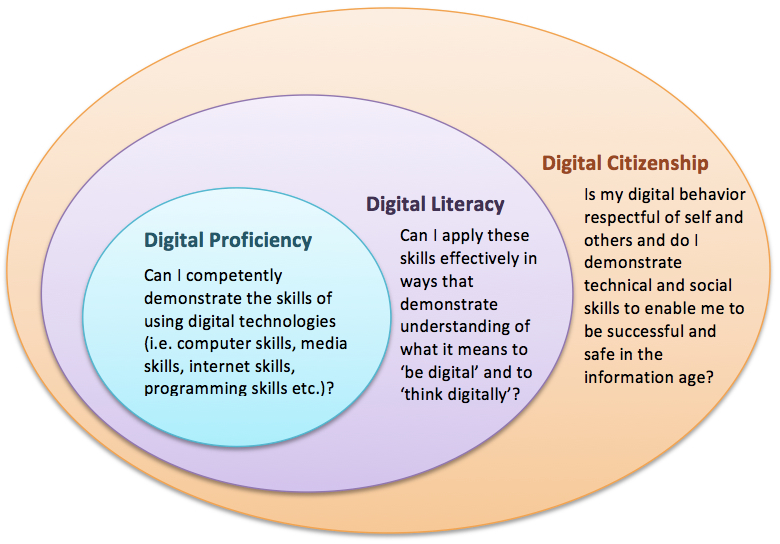 Simply put, digital literacy represents a person’s ability to perform tasks effectively in a digital environment. The power of literacy in this context lies not merely in the ability to use the various tools and applications, but rather in an individual's capacity to effectively and critically navigate, evaluate and create information using a range of digital technologies. This includes the ability to read and interpret media, to reproduce data and images through digital manipulation and to evaluate and apply new knowledge gained from digital environments. It’s a bit like learning to read and write. While building a vocabulary of words and being able to represent them in written form are pre-requisite skills, becoming fully literate involves a much wider and more complex range of abilities – engaging with text, extracting meaning, synthesizing, analyzing etc. Developing digital proficiency and becoming digitally literate can, to a significant degree, be achieved by an individual. They are important, indeed essential qualities and characteristics for an individual to possess if they are to lead productive and satisfying lives in the digital world. Yet to be fully functional in the digital world requires more than this. It builds on the awareness of being part of something bigger than one’s self, and of the need to temper one’s individual use (or misuse) of digital technologies with the responsibilities that emerge from understanding the impact of our own behaviors on others. It requires a sense of ‘citizenship’, and the rights and responsibilities associated with that. In thinking about this I was reminded of a diagram explaining the information age that I first drew up for classes of initial teacher educators I was teaching back in the early 1990s. It’s not an original idea, and versions of this sort of thinking have appeared in all sorts of forms over the past decade or so. 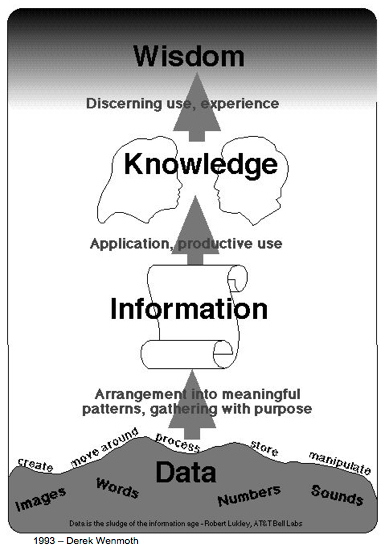 The diagram begins with data at the bottom – the building blocks of all information. When gathered with purpose the data becomes information. When used in context, the information becomes knowledge (some have added ‘understanding’ here). But when knowledge is consistently applied and becomes embedded in action, it becomes wisdom. I see the discussion about digital literacy developing in the same way. The building blocks (data and information) of the digital world are the skills and competencies we develop that make use digitally proficient. Applying those in our daily context makes us digitally literate. But developing the wisdom associated with being respectful, keeping ourselves and others safe and being productive in the digital world is what characterizes us as citizens. I’ve attempted to capture this thinking in the diagram at the top of this post. The challenge I want to post is, should ‘digital literacy’ be our aspiration for the young people in our schools? Sure, being digitally literate will likely provide them with greater opportunities for employment and success in life, but shouldn’t we aspire to see that success and participation operate at a much higher level than simply what benefits the individual? As our thinking at both school and national level continues to develop, I vote for an emphasis on nurturing our young people with the competencies required to demonstrate qualities of citizenship in a digital world.